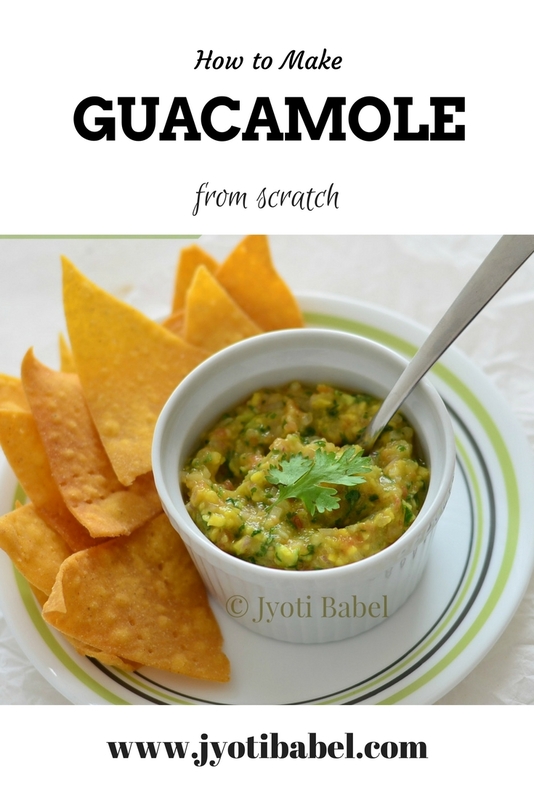 Guacamole is a Mexican dip made with ripe Avocados. 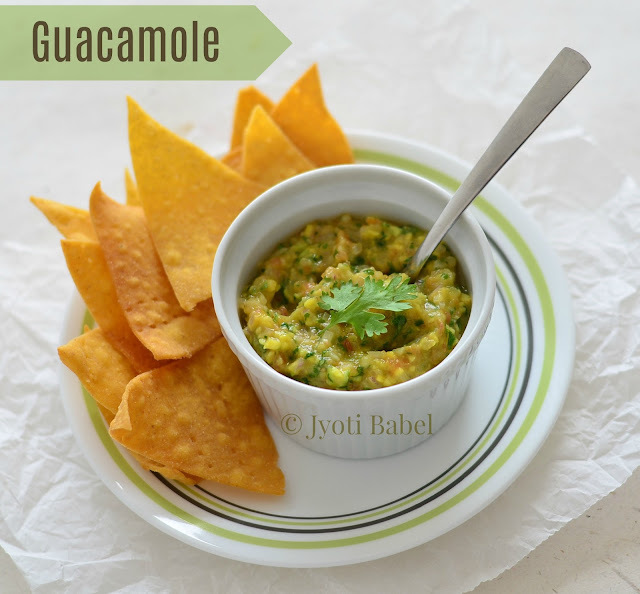 When the mashed chunks of Avocados are mixed with minced onion, tomato, chopped coriander, seasoning and lemon juice, you get this delicious Mexican dip that is a must-serve in any Mexican meal. I first tasted avocados when I was living in Dublin. To tell you the truth, I found it a little too bland for my taste to eat it raw. A few pieces here and there in a salad is fine, but not more than that. But, avocados in the form of this dip is delicious. I can have spoonfuls of it and yet want more. When you are making tortilla chips, making this dip is a must. In India, avocados come under the exotic variety of fruits and it comes pricey. So, whenever I buy it, I make sure that I make the best use of it. More often than not, I find they are raw when I buy them. so, I keep them wrapped in paper for 2-3 days, till they are ripe enough to be used. Here is how I make guacamole from scratch - it is an easy, no-cook dip and can be whipped up instantly. 1. Keep all ingredients chopped and minced before setting out to scoop the flesh of avocado as it has a tendency to get brown. 2. Slit the avocado from the middle and divide into two parts. Remove the stone and using a spoon scoop out the flesh. 3. Collect the flesh in a medium bowl and using a fork mash it nicely. Add all the listed ingredients and mix it all together. Adjust salt to taste. Cover the bowl tightly with a cling film until serving time. 4. Serve chilled with tortilla chips. Enjoy! Some other Mexican recipes you can check here. This is one of my favourite dips , we all love it ! Sadly the avocados here are very heavily priced , in spite of that they are no good ! And when you don't get a particular thing your cravings increase , right ? Omg, this guacamole is my all time favourite, drooling here rite now. That bowl surely looks so colourful!...I have been wanting to make Guacamole for so long myself! My all time favorite dip. Love this in sandwich, fajita and what not. awesome. One of my fav dip.. Perfect with tortilla chips!! I love to use guacamole in everything and anything, as a dip as a spread and as a dressing. We are fortunate enough to have avocados growing in our country and its available mostly throughout the year. However I hate it when it doesn't ripen well. My favourite dip. Like you say its very expensive in India and hence try and make maximum use of these fruits. LOVE guacamole -- so healthy and so delicious. Yours looks just perfect.